I have an intense and deep appreciation for the Canadian landscape. It has inspired my work for my earliest days as an artist. I paint predominately plein air as the energy of my surroundings has always played an important role in my work. I find a great deal of solace and happiness in creating but coincidentally, my introduction to art was born from a place of anger. In my youth, I was grounded to my room and the only outlet I had which hadn’t been banned, was a book on animals, paper, and pencil. I spent hours drawing animals from that book, and ultimately found that my anger had disappeared and my love for art was born. I have spent the last 40 years since my introduction to art, painting both small scale and large scale. I started my career as a mural artist, painting murals at Howl at the Moon, Louis’ Lodge, Bluevale H.S, and other local establishments, including murals that I donated to the Grand River Hospital and The Children’s Museum (now TheMuseum). This transitioned in web design, starting during the internet’s earliest incarnation through present. Whether creating online graphics or large murals, my true calling lay in small-scale works in acrylic, oil, and watercolour. In 2015, I made the decision to become a full-time artist and commit myself to my one and true passion, creating landscapes and abstracts through watercolour, ink, or acrylic. 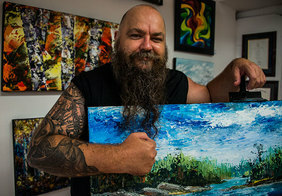 I opened Wallhalla Art Studio the same year, and established studio space at Globe Studios in Kitchener.